"An imaginative story with creative and quirky details told through the eyes of a child, is one that students will not forget." "This sweet story is beautifully illustrated and will captivate young children. The magical, yet simple tale will appeal to both young and old, and will make a great read-aloud. Friendship, kindness, and loyalty are the lessons children and adults will take with them, and the book will be read over and over again to recapture its quiet joy." "The artist captures the fun that is inherent in such a charmer of a story. Using watercolor, colored pencils, and pastels, she creates memorable images that match the tone and delight of this homage to a child's innate ability to suspend belief when the situation calls for it. Bravo, Zeke!" "This imaginative tale displays a charming sibling relationship, somewhat reminiscent of Marie-Louise Gay’s 'Stella and Sam' series, that will leave the reader wanting more. The delightful text is told with gentle humour, and Bree Galbraith’s ending is upbeat and clever...The illustrations, done in watercolours, coloured pencils, and pastels, are as appealing as the story. The childlike, whimsical drawings suit the playful text...Highly Recommended." "The artwork, done in watercolor, colored pencil, and pastels, is as droll as the text...This story is for every child who has ever let go of a balloon and wondered where it went. Zeke's fanciful story is a gift to his younger brother, strengthening the bonds between them. It is a fine choice for storytime and a welcome addition to all libraries." "Galbraith's Zeke tells the story in a voice so like a real older sibling that readers will be captivated and believe, as Theo does, that the lost balloon is in a happy place...Malenfant's illustrations...layered over soft, swirling backgrounds...bestow a dream quality on Zeke's imaginative tale. 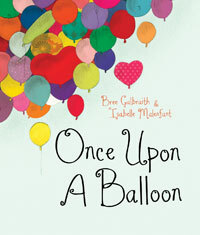 Between the story and the illustrations functioning so perfectly together, Once Upon a Balloon is a magical story that leaves young readers with a sense of security and contentment." "A lighter-than-air answer to that eternal question: Where do balloons go?...Malenfant uses a deliberately childlike style to illustrate this sweet flight of fancy, which celebrates storytelling, the bond between siblings and the wonder of a serendipitous connection, all at the same time." [Starred review] "Galbraith demonstrates an intimate understanding of a child's inquisitive, innocent nature...The fantastical storyline is enhanced by Isabelle Malenfant's whimsical illustrations. With a hint of Quentin Blake and a dash of Antoine de Saint-Exupéry, Malenfant captures the story's spirit, exemplified by a particularly striking illustration of a grey chicago enlivened by colourful balloons that drift among the skyscrapers. Once Upon a Balloon playfully teaches a couple of important life lessons. Children will be delighted as Theo persists (and succeeds) in trying to help Frank, and adult readers may be reminded of something too easily forgotten: that a childlike sense of wonder is something to be treasured."